In the outskirts of a Catalan city, inside an anonymous industrial warehouse, one can find hundreds of treasures. Their owner, the largest electric utility company of Spain, didn’t take the time to put its name outside the building, but instead contracted a security service to take care of it. Maybe that’s because a sign with the company’s name on it would be – for some passers-by – a synonym of electric material. And electric material means copper, copper being something for which some would risk trespassing the warehouse fences. Yes, probably this company does not want to take risks. After all, maybe the treasures inside the warehouse are not that valuable. Or, better said, they are valuable only for some people. And in any case, whoever really makes the necessary effort to find their way to the building will end up finding it. The treasures hidden inside the warehouse are not only (made of) copper. And neither are copper and its extraction the topic of my research in political ecology. Treasures are old turbines; dusty scaled models of power stations already dismantled; huge rusty trucks with rotten tyres, busted jeeps from different decades, all painted with the company’s logos and acronyms. There’s probably enough material for a few museums. An endless amount of objects and tools, many only recognisable to experienced workers and engineers. And next to them, isolated by pre-fabricated walls, a library and an archive. For most researchers, an old broken Land Rover that rolled through the Pyrenees valleys for years is probably more evocative than shelves and shelves of books, manuals and old documents. After all, a 4WD seems more related to the abstract idea of “fieldwork” than an archive. I heard that one Spanish Civil War expert (and collector) worked for years in an electric company, travelling often through the mountains that had been war scenarios between 1936 and 1939. Week after week, valley after valley, taking care of the high-power lines, he gathered an impressive collection of (military) pieces. Now that looks like exciting fieldwork – probably too much for me. But forget about 4WD and wars for a while. At some point, despite the panorama in front of me that more closely resembled the last scene in Raiders of the Lost Ark than a boring company archive, I remembered that what had taken me there was quite a simple motivation. To be exact, I was searching for a picture. 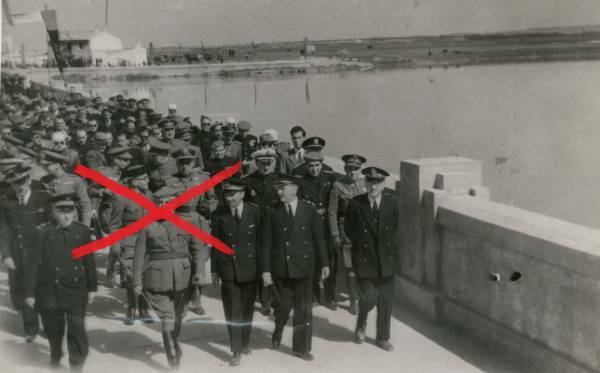 A few weeks before I found myself in this situation, someone wrote to me asking if I knew where to find a picture of dictator Francisco Franco inaugurating dams. Not that this was a very difficult search, or so I thought when I started looking. During the Francoist dictatorship (1939-1975), Spain became the country in the world with the most dammed water per person. “Paco Rana”, was one of the dictator’s nicknames. “Frankie the Frog”, was the catchy translation coined by a professor; the phrase was so successful that it even found its way into the title of a research article. But soon I found that Google Images gave no satisfactory results. And that it was necessary to locate the picture in an archive, learn about the copyrights, etc. The recently digitised Francoist newsreels, No-Do, were full of such images. But the images captured from newsreels were not of sufficient quality for a publication. So, I gladly accepted the challenge of finding the picture in an archive, knowing that usually most of the fun is in the journey, not just in arriving at the destination. As a historian, going on fieldwork is sometimes (not always!) about diving for weeks in old papers and boxes. One must know the archives that keep information about the period of study at hand. Private and public. Their collections. And, most of all, how to access them; how to consult their catalogue. How to know what you can find there, how to review its contents as quickly and efficiently as possible. Because we often don’t know exactly what we are looking for. That’s why I prefer to have the chance to ask “what do you have?” than simply to be asked “what are you searching for?” It may not appear so exciting, but archival work is the source of an endless list of anecdotes, which are not banal. Especially if one is working on topics related to a war or a repressive 40 year-long dictatorship. Funnily enough, none of these applies to the case at the centre of my story. This one seemed easy. “I am looking for the classic picture of Franco inaugurating a dam”. Where to start? I will only write about one thread. The largest electric utility company of Spain had to have an archive. But that didn’t mean that consulting it was going to be easy. No direct results via Google. There was just a section called “contact” on the website of the company’s foundation. No contact e-mail. No direct telephone number. Just a questionnaire to fill in. Thanks for your request. We will contact you as soon as possible, or something like that. Great. One more task ticked off the list. Let’s wait for their call. It’s only that it didn’t come. I tried twice. Two weeks without an answer. E-mails and internet are easy and not very personal. But the telephone of course remains to be a fundamental tool to speed up some processes and to find the right people. So let’s call the big transnational company in Madrid. Find the way to the department in charge of heritage. You will be asked to use the web, not to call. “But I have already used the web”, you must mention. If you have already used the web, you will be told you must be on the waiting list and soon will be attended. Then call again. Insist again. One day, someone might recognise nonchalantly that, it is true, the web questionnaire doesn’t work that well, so let me check if you are in the waiting list. No, you are not there, funny, huh? Well, it is true, sometimes some requests are lost. So keep the name of the last person you talked to. Repeat the request. Call immediately after. Confirm they received it. Wait. Insist. We will forward your petition to our section in Catalonia and they will contact you as soon as possible. Why Catalonia? Originally, the company controlled most of the electricity supply there. Several dams had been built there since the 1940s. Dates are known. For sure Franco was present to inaugurate them. Narrowing down is important. Back-up plan. It is not always possible, but is worth trying. If you know someone inside, things are easier. I know people that know people – someone said. The few utility companies I have researched had a strong family tradition. For decades, they prioritised contracting the relatives of the workers. In this case, at some point I met an ex-worker whose father had already been in the company. And this paved the way to the direct telephone number of the Catalan archive. Eureka?! Well, no. Unfortunately, sometimes shortcuts don’t work. Official procedures had to be followed, and the archivists told me I had to go the website, find the “contact” tab, and, OK, I knew the story well enough by this point. It was “Madrid”, as they put it, who had to contact them, and only then they would contact me. And so they did, when they finally got my petition. In the end, less than three months between the first contact and the actual visit to the archive. Pas mal. Needless to say, I didn’t find the picture I was looking for. But as soon as I entered the warehouse, I knew that it didn’t matter that much. I would probably find it in a more conventional archive, after flipping through hundreds of pictures of the dictator and his social events. The time would come. And the company collections were spectacular. Large hydraulic projects, in detail. A specialised bibliography, very difficult to find in other places. And two nice archivists that knew their collections by heart. Mostly they received visits from engineers, but there was a lot of relevant material for other researchers. When archival research is over, it is sometimes difficult to imagine the stories behind every little piece of data. Weeks, months of work are often reduced only to a line, a footnote. And when revising our work, we repeatedly stalk lines trying to reduce the word count. Pictures – they usually don’t even go into articles. Unless you want to pay extra.